That is a very complicated question. and it’s one that we will not completely answer in a short post. However, it is one that we all need to think through, because it’s a question that all of us will face at some point in our Christian lives. Either we will ask it ourselves, or someone else will pose the question. In order to end up with the right answer, we have to start in the right place. We must start from the understanding that God did not create suffering. All suffering is a result sin in our world – and God did not create sin. God created a world in perfect unity with Himself. Suffering is the result of a break in that unity. It is the fruit of rebellion against Him and His ways – which has broken our world. And a broken world filled with broken people is the cause of all suffering. But all is not lost. Our God is not only creator. He is also Redeemer. He can and does redeem even our suffering for His glory and our good. Now sanctification is a “church word” that means the work of the God’s Spirit in us, changing us; making us like Jesus. 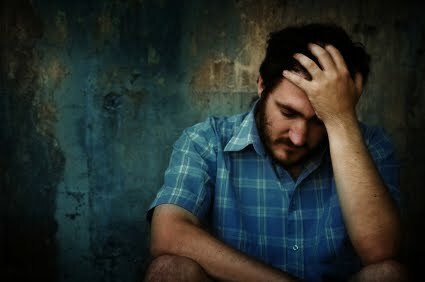 If you’re suffering today, and that suffering is the frustration and disappointment over your personal sin, Jesus’s answer to your suffering is the same as it was to the leper so many years ago, “I am willing.” As we acknowledge our sin and confess it, we can rejoice in the fact that we are free from guilt of that sin and His grace can also free us from its power. That sounds good, but what does that look like in real life? It looks like this: as we repent of our greed, and confess it as sin, the generosity of Jesus begins to flow into our hearts in its place. As we confess the lust in our hearts, we begin to see people differently. We no longer see them as the objects for our own personal pleasure. As the love of Christ fills us, we begin to see them as the objects of God’s merciful love. As we confess the fear that keeps us from doing what we know God has called us to do, we are filled with the faith to follow, even when our hearts remain fearful. His condition was not a result of personal sin and the delay in his healing was not because of a lack of faith. There was a purpose behind it all. He went through his entire childhood, adolescence and part of his adult life blind, so that God could be glorified in his healing. I’ll be the first to admit, this kind of suffering can be hard for us to stomach. It may even seem cruel. Let’s face it, it is cruel, if you have a man-centered view of the world. If our theology has us at the center of the universe rather than God, and we think it’s God’s job to make our lives safe and comfortable, then this kind of suffering is going to baffle our minds and trouble our hearts. We are going to struggle with how the will of God plays out in our lives while we are living in a broken world. If my life is about what I want, not what is going to glorify God, then God’s will is often going to be confusing if not faith-shaking. I guess that leads us to a difficult question, are you willing to be a living sacrifice, a living example of God’s greatness – even if that means suffering? Can you still hold to the truth that God is good and that He loves you – even when you suffer? Those are important questions because, sometimes God want to show His power by bringing an end to prolonged suffering, in a way only He can. And I can speak from personal experience in this area. One of the ways we suffer is when the things God calls a blessing in this life seem to allude us. One of those things is children. For the first 10 years of our marriage, my wife Julie and I were infertile – even though it took us a while to realize it. The first couple of years were a bit of a whirlwind for us. First, our marriage was in shambles because of my sin. Then we got radically saved and our marriage was miraculously healed. In response to God’s amazing grace, we found ourselves going on mission trips, retreats, and serving God in any way we could. It was an incredible time. But then one day we heard a TV commercial that said, “If you have not been using birth control for more than a year, and you’re not pregnant, you might have a problem.” Well, apparently we had a problem. At that moment we had no idea how big the problem was or what was ahead of us. We had always imagined ourselves as the cool young parents. We were only 22 years old when we got married and we were about 25 when we first recognized our infertility issues. And in keeping with our youthful ignorance, my wife Julie made this statement, “If we don’t have children by the time we are 30, I’m getting my tubes tied.” After all, at this point we were only 25; and 30 was really old. But not long after that, the Lord spoke to her in a dream (don’t worry – we’re not the type that are always having visions and dreams. This was an unusual exception). The Lord spoke to her and said, “You will not be pregnant until you are 30.” We didn’t know how to take that. After all, at 25, waiting until 30 sounded like some kind of curse. But then 25 turned into 26 and 27 into 28. We were seeing fertility doctors and receiving treatments. Julie was being poked and prodded and injected; and I had surgery. Meanwhile the years were ticking by; 28 turned into 29 and then 30. And somehow, in the midst of all that, something changed. What was once a curse, had become a promise. Rather than despising it, we were holding on to a baby at 30. And on the last month of Julie’s 30th year, only a few days before her 31st birthday, we found out that she was pregnant. The word of the Lord was fulfilled. Isn’t that a great story? We should just all hug and make a Thomas Kinkade painting of that moment. Oh how I wish the story had ended there; but it didn’t. 8 weeks later Julie miscarried. We were left left in a cloud of confusion, wondering what this was all about. We were left suffering. But in His mercy, a little more than a year later, we were pregnant again, and off to celebrate our new baby and our anniversary at a bed and breakfast. And that’s when it happened. Julie went to the bathroom in the middle of the night and she was hemorrhaging. We were loosing another baby. We couldn’t believe it. We both collapsed in the middle of the bathroom floor sobbing like babies. There was no phone in the room, and in 1998, cell phones were only for the rich and famous. We had to wait till morning to use the land line in the main house to call the hospital. The owners of the B&B must have thought these two blubbering kids were freaks. On the phone our nurse told us to come straight to the hospital for a post-miscarriage DNC procedure. It was a long and very somber drive back to Bellflower, CA. We got there and they wanted to do an ultrasound before the procedure, just to be sure. There was no need to explain what to do. We knew the routine,. Julie goes to the bathroom, and I wait in the ultrasound room. We had been there so many time before, yet none of them as bleak as this one. In the couple of minutes that I was alone in the room, I offered up one of the weakest and lamest prayers in the history of man. I simply said, “God, if you were going to do a miracle, now would be a great time.” That was it. Not exactly a mountain-mover. Then Julie came back into the room and we started the ultrasound. Almost instantly, the expression on the face of our nurse Gale, said that something was wrong. First it was concern, but then it broke out into a smile that lit up the room. “I have a heartbeat,” she shouted. There was still a baby. And on July 17th, 2000, Ethan Michael Marquez was born. We suspect that he was a twin, and his sibling was miscarried, but we’ll never know exactly what kind of miracle God did that day – and it doesn’t really matter. But it was definitely His handy work. It was a long, hard and painful 8 years. It is something that we would have never chosen for ourselves, and wouldn’t choose to do again. But what I can say is that Julie and I have often looked back on those events as a reminder of God’s faithfulness. That long and painful season of suffering, has spoken volumes to me and to many others; about the power, the faithfulness and the mercy of our God. Both Julie and I have had the opportunity to share this story dozens of times, and every time, God is glorified. Sometimes we suffer and God gets the glory in the end when He brings a resolution to the suffering. But other times there is no resolution – and yet God is still glorified. In those times, God is glorified through our suffering. Instead of His miraculous resolution, it’s the grace that God gives, in the midst of the suffering that brings Him glory. In the garden of Gethsemane is probably our best example. Jesus saw the suffering ahead of Him, and asked His Father to take the cup of suffering from Him; if it was possible. Luke captures that moment in Chapter 22 vs 44 of his gospel, “Father, if you are willing, remove this cup from me. Nevertheless, not my will, but yours, be done.” He asked to avoid suffering, but in the end, He submitted to it; and our salvation was purchased – God’s ultimate glory was accomplished. Though Paul’s suffering was never removed, the grace that Jesus gave him to deal with it, far outweighed the suffering; and God was glorified. It’s why Paul could write earlier in 2 Corinthians 4:17 “For this light momentary affliction is preparing for us an eternal weight of glory beyond all comparison.” Paul knew what he had in Jesus – it was beyond compare – regardless of his suffering. Sometimes God is glorified as we become more like Jesus, when He ends our suffering by rescuing us from the power of our personal sin. Sometimes God is glorified when He brings a miraculous resolution to our suffering. Sometimes God is glorified as He pours out abundant grace and comfort, in the midst of our suffering. But none of life’s suffering will make sense unless we realize that our lives are part of a story bigger than our own – they are intertwined with the story of God. It’s His story not ours. He is the lead, and yet we all have an important role to play in the grand drama of God’s eternal plan. So, whether we are immediately set free from the suffering of sin, we are eventually set free from a long season of suffering, or we are given the grace to endure the suffering, it is all for the Glory of God. Nothing like the pain of this world to make one question God. My family and I have gone through much in the last five years because my industry is dead and we have lost it all! We learned in all of this that we can not let our experiences be our revelation of who God is. In all of our suffering, we have to always let the word of God be the revelation of who God is. Sadly there is a very strong message in the church that says God only intends good for you and not to let you suffer harm. Then when hardship comes, people start having a hard time with God because He is not being the way they were told He was. Looking back I think God let me suffer so much to cleanse me of the blab it and grap it gospel. Now I have learned to be in want, not knowing how I can get the basics for my family. In all of this we see our faith growing. Not because our experiences are all good with God. Rather becasue we let His word be the revelation of who He is. Such an excellent story and a very well put sermon addressing suffering; “the problem of evil”. God Bless your family and your ministry! Thank you. Grace and peace. Previous Previous post: What about all the Santa Stuff? Next Next post: Don’t Grab the Glory.